Our next litter of German Shepherd puppies for sale in NC from titled, imported Czech German Shepherds, should be available end of July, 2015. 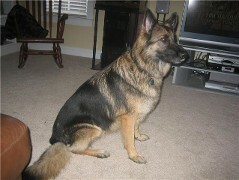 The mother, Ebigeill z Get-Pet, ZV1, is a newly Slovakian imported sable German shepherd. She was bred in Slovakia to Aron Wind Wild, IPO3, and the pups will be born the end of May, 2015. In the future she will be bred to our Schutzhund 3, IPO3, Slovakian imported, Alan Schrom. There are no more puppies available from previous litters. .We invite you to submit deposits on our future litter which will be available the end of July, 2015. It is letters such as these below that give us joy as German shepherd breeders, and inspire us to continue breeding German shepherd puppies for sale in North Carolina. 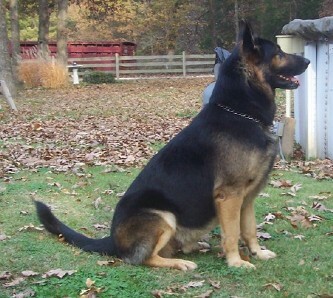 We strive to give the best service of all German shepherd breeders in NC. It is our joy to continue to produce German shepherd puppies for sale in NC and continue to meet appreciative forever owners of our NC German shepherd puppies. Our German shepherds produce NC German shepherd puppies of most black and tan shades, including solid black German shepherds. Although we originally bred and trained our GSD in Missouri, we plan to stay in NC and continue to produce high quality German shepherd puppies for sale in North Carolina. The puppy is doing awesome. He is very intelligent, but you knew that already. I try not to boast too much about him, so I let him do the talking with his crisp training routines. My neighbors are blown away at how well trained he is, well for normal dog owners, the sit, lay, even come here is amazing, then I run him through the sit, down, shake, speak, roll over with silent hand commands and they just cant believe a puppy thats only been in my home for two weeks is capable of such behavior. Its so cool!!! I often tell myself, dont load him with too much training, he is so young, but then I go, well lets see if he will do this, and he does it. The more I give him to do the more he likes it. I still keep the sessions to no longer than 5-7 minutes at a time but when he is dialed in to the "lets train" mode, he is on his game. 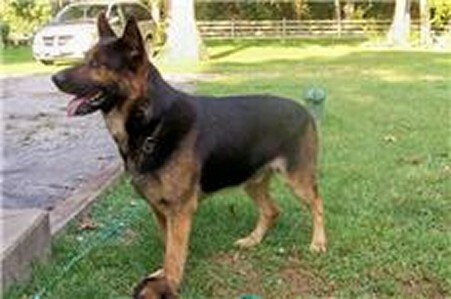 I am promoting VomWeiland GSDs at every opportunity, and Gunnar (my son has named him "Bo") is doing most of the work. I will be putting another, better quality video up on Youtube soon, and will let you know. Here is the link to a youtube video I uploaded. Its not the best, was holding cellphone while working with the pup. But you can see him learning fast. I will get a better quality video uploaded soon and let you know. After a long search, we found VomWeiland German Shepherds in Bath, NC and made the decision to obtain our puppy there. 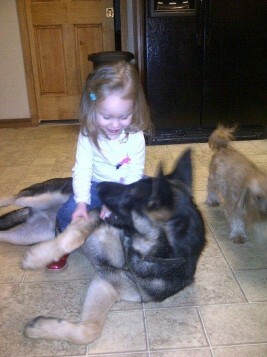 Sandra Weiland/Breeder is truly amazing to offer such a High Quality GSD at the price she does. I put a deposit on the Nov 2013 litter in late Sept and took delivery of the solid black male pup Jan 9th 2014. The 8 week old pup is amazing, truly the most intelligent pup I have ever owned or seen. Sandra had the pup potty trained and crate trained the day I got him, really, no kidding. The intelligence this pup displays already is incredible. I have only had him in my home for 6 days now and he sits, lays, heels and speaks on command consistently. My friends cant belive it either. Check out the VomWeiland.com look at the photos and videos and you should be convinced. You can pay a couple thousand more, but you'll be hard pressed to find a better dog. From Robyn T (NC) (Cira Hurkak Nov 13, 2013 litter Purple collar boy): At nine weeks, Gunner is doing so great. He's going to the back door and letting us know when it's time for pee or poo. He and husky are playing nicely, both inside and out. Husky likes to get frisky and wants him to chase her outside. We were going to do his nails tonight, but the Dremel I bought needed another attachment. Will get the attachment tomorrow and try nails again. We love him to pieces. He's going to bed about 9:30 and waking about 4:30 for pee, then back to bed until 6:30 or 7. He likes his kennel and goes in freely during the day. The one picture I sent was him last night before we attached the door. He was laying on his back in his cave. He had his first vet check yesterday. Our vet thought he was just awesome and both he and the assistants wanted to know where we got such a great pup. He weighed 15.7 yesterday. The vet gave us some good advise on massaging his spine/hip areas. He said there's research now that regular massage of the spine/hips helps developing big breed puppies. He said regular massage, when loving on them anyway, helps hips develop nicely. We figured out when he tries to play bite, if we immediately start "working" (ie leave it, sit, down, stand) it switches him from being so crazy wanting to bite play, to working. We did that today and he was much less biting everything. Holding his muzzle didn't seem to work for him, he just thought we wanted to play harder. 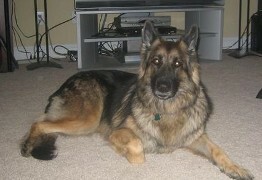 After seeing my cousin's GSD from your 2009 litter I knew that a Vom Weiland Shepherd was what I had been looking for. I quickly sent in my deposit and started the waiting game, until I received an email about an 8 month old Kingzu being available. We picked him the next week and I can say without a doubt this has been the most well trained 8 month dog I have ever seen. Sandra clearly took hours and hours of time and put all of her pride into this dog. He has his AKC K9 good citizen award, and Star award to show for it. He is fully leashed trained, with sit, down, and stay. House broken, crate trained and clearly shown lots of love. I have never purchased a dog where the breeder took so much interest in her dog’s wellbeing, and training. 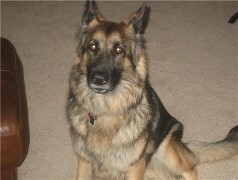 I can without a doubt recommend Sandra and her GSD’s to anyone looking for a top notch GSD. Sandra I know that you were very attached to this dog and would just like to tell you that he has bonded with me, and I with him, and follows me everywhere inside and out. We have been making short trips to work and hopefully plan on giving him 40 hours a week soon. I will send pictures soon. Thanks for Sturgis, who at 6 months of age was the superstar of the Top Dog Training Program here at Greenville, NC. She was so good, so smart, learned so quickly, and did it so very well, that someone there offered me a lot of money for her. Mark ( March 2007) Sturgis was one of our earlier German shepherd pups., before we moved her to be German shepherd breeders in NC. Here is Bella in her new home; we love her! Thanks for sending me the CD with the Czrchoslovakian/English commands. We will use the Czech commands with her, so that other people will not be able to command our dog. She is getting along with the other family pets; also, our 2 year old son absolutely loves her and he plays well with him. I sent a photo of obedient 8 week old Brutus and obedient 3 year old Sofia. You can see both obedient children. Yes, that is what I meant by obedient! Brutus already pees and poos outside (we have a large fenced back yard). If need be, he has peed on the papers in his crate. I thought my sister and brother in law were going to get the last girl, but I guess not. They were impressed by the website and that Brutus at 7 weeks old was paper trained, crate trained, and played fetch. What is really funny is that he respects our large male cat... the cat smacked him - he is declawed. This is Brutus from the 8/16/09 litter. Here he is 7 months old and 68 pounds. He gets a lot of attention - I have been sharing your website of German shepherd puppies. This is a photo of Baron at 6 months of age. He has been wonderfully easy to train. Baron is doing quite well in his new home. He walks daily with me on the leash, with good leash manners. He has learned to sit, lie down and to stay. He is responding quite well to my training; I am impressed with him as a 9 week old puppy. He shows great promise and willingness to work for me. I am confident that within a year or so, he will be able to work with me as my partner in my Investigation Agency. (At 10 weeks of age), Beowulf is doing great. He sits on command and walks with the family three times per day on his leash. He already enjoys carrying his own leash. He is going to be a SMART dog. Training him is a charm. He does love to bite though and those baby teeth are ever so sharp. haha. thanks to you Sandra, we love him! Pictures of him coming soon. 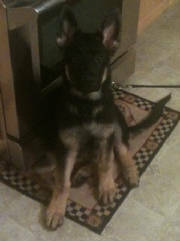 Update on Beowulf: as of November 17, 2009; I took him to the vet; at nearly 14 weeks old, he weighs 46 pounds. The vet was totally impressed by him and said that he was the nicest of the German shepherd puppies he has ever seen. Cheryl is delighted to report that at 8 months of age, Beowulf passed the required tests conducted by three judges to be a pet therapist dog. He was required to be disciplined, obedient and accepting of new people. He is a special dog, a credit to his breed. Thank you again for your wonderful hospitality over the weekend. We had an uneventful drive home. (Dupont, SC) Both pups slept for most of the ride and promptly peed upon our few stops on the way home. They adjusted well to their first day home - they played on our back porch, and played with each other often. They were wrestling each other, sharing the same food bowl and snuggling next to each other for their naps. They peed and pooped every time we took them out and when they didn't make it, they went on the cardboard/papers in the house. Such good German shepherd puppies! Our girls LOVED playing with them, and the pups were giving all of us lots of puppy kisses. Both pups love to have their tummies rubbed. We attached a few pictures of the ride home (cuddling together in the cage), sharing their dinner (even when there are two bowls - they both ate out of the same one) and crashed out in their new favorite napping spot on the back porch. We will keep you updated! Will plan on sending pics soon. They are growing fast. Over 30 pounds each and smart as ever. Personalities are defined more. Eli is definitely the "Drama King" of the two and Elsa is just relaxed and more confident. Eli is gaining confidence ... he no longer runs for cover when a car drives by :>) Elsa is doing FANTASTIC with ball retrieval. Eli refuses lately to pick the ball up (he'll chase it), but would rather chase down a stuffing-free squirrel and bring that back to me. Both do great on Sit and long Stays and working on Down. They are a true joy and we are continuing to enjoy their personalities and constant enthusiasm for play. I will send you pictures as I upload them. I weighed her last night and she is up to a lean 22lb already. I don't mind you putting Gennavive's pictures up on your page...she was my first baby (the first I trained from the get-go)and she will always have a near and dear place to me. Chaya is looking to be a close rival to her spunky personality though...haha...she is quite the determined little creature. Kellan is adjusting very well, he is so sweet with Madilynn (one year old baby) and VERY calm and laid back. Last night he did the funniest thing. After Madilynn goes to bed I lay on the front room floor and do my school work. Last night right after I started doing my homework Kellan walked right over to me and layed right beside me and watched me do my homework and TV. He usual comfort spots are in his crate (which I leave open for him to come and go when I'm walking around the house), but when I'm feeding Madilynn her bottle or watching television he like to sit at my feet. He gets really excited when we first get home and has not had a single accident in the house!! We have been working on his stay and he is doing really good. I can walking away from him and around the kitchen and he just calmly lays there and watches me. Gibbs has been seen by many people in the Schutzhund clubs and by a man we met on the ferry who was a canine officer, with his police dog. All of them were very impressed with the puppy; they were talking about his tremendous drive, that he had huge potential for the Schutzhund sport, how gorgerous he is, and how lucky we were to have got him at such a cheap price. They were interested in where we got him. We are very pleased with Gibb's progress. He is learning quickly, and we have become interested in doing the sport of Schutzhund with him. We have taken him to two different Schutzhund clubs in our area. I like all the pictures you took. Kingzu is very well behaved young puppy. He looks very healthy, alert, his coat very shiny and he looks very beautiful and wonderful dog. I'll be looking forward to see him. He such a lovely dog. I missed him very much already. I'm hardly wait for another 4 months maybe. Sandra, I don't know how to thank you for taking care of Kingzu, you worked very hard to train him and spent time with him. Kingzu is a very precious dog. I hope Kingzu will get here to Hawaii with no problem. Live with me and take care him ever after. We hope you had a nice time on your cruises. I am sure it was warmer than here in SC/NC where it has been snowing and raining. I love the new website design. Very user friendly, great format. A few comments - on our page, Elsa is written as Eksa and where it says "Carsten" on the bottom of our Eli/Elsa page, it shows Caespers pictures, not Eli's. Also, the pictures that I sent you via email are blurry on the website. Is that a function of transferring them over to the new website? If they remain blurry, do you want me to send you a disk with pictures on it so you can directly transfer onto your website? I'd hate to have such beautiful pups look blurry on your website. Just let me know - no problem to do that. The dogs are doing GREAT. They each weight approx 65 pounds, Eli is much bigger in stature than Elsa - I swear his head is 2X as big as hers!. We recently fenced in our back yard and it has been a joy to see them run wild after each other in the back yard, playing peek-a-boo between the pine trees. They are both in the house, free roaming, and have calmed down considerably. Both bark instantly when they hear doors open, or strange noises (although Eli also barks at his reflection in the fireplace and Elsa barks at the coffee maker and vacuum cleaner). Both dogs listen well to us, as well as to my parents, who are visiting. Eli loves to jump up on people, but listens after a few commands. I walk both of them at the same time, and they trot right next to each other. Eli prefers to walk on the left of Elsa, and will purposely back up and switch if he isnt on her left. They occasionally "kiss" each other as they walk. Both dogs follow me around the house, Elsa's favorite spot is under the computer table, laying on my feet. We get several compliments on what beautiful dogs they are, and they both have the sweetest dispositions. I'm very excited and emotional happy today when I was watching the video that you took yesterday and thursday. Kingzu growing fast very obedient listen every command you told him to do. Sandra you did an excellent job. I know in my heart you worked very hard for training Kingzu he get this far all your expertize and experience help him even more that you care for him very much. I don't know how I thank you Sandra what you have done for him. Yes, I love it very much if you send it the paper work for the AKC S.T.A.R medal and certificate mailed it to me. AKC good citizen tittle prepare him take the test. I'm very happy about all the good news you have been telling me. Thank you again. How I'm going to make up for you all the good things you done for kingzu. I did enjoyed very much the video that you sent to me. It's been a while. I am the purchaser of Bella, one of your puppies. My mother in law and father in law now own her on a huge piece of property: she is soooooo loved. I am including a couple of pics, I know they are very delayed. Also, her owners are interested in information about breeding her. They have spoken with some people in this area but I don't feel that the quality of the dogs are up to the standards of Bella but I am having trouble explaining the difference in her and why her blood line is different from these other dogs. I thought you would be able to send them in a much better direction. If you could pass some info to me I would love to send it to them and I'm sure they would then be inclined to speaking with you about it. It's very important to me that she is kept with the best she is such a perfect dog and they love her so much. I just feel like the German shepherd breeders with the other shepherds want to breed with her so they are talking there dog up. Thank you so much for this wonderful dog. I hope this email finds you well. I am very late in getting you those updated pictures of the dogs. My parents were visiting all of February and then with dance competitions, school activities, etc., I have been unable to get back to pulling a disk of pictures for you. The dogs are both doing wonderfully. Eli has grown BIG - he is so much bigger than Elsa. He is a kind-hearted, big loving dog who will flop over and let you scratch his belly and loves getting attention. Elsa is the much more serious dog. She lies by my feet and crawls under the computer table to be near me, but doesn't particularly like to be scratched and cuddled unless she is in the mood for it. Both dogs retrieve the ball, however, Elsa is more head-strong and prefers a treat to give you the ball (however, she will lie down ON my feet to give it to me), whereas Eli will just drop it at my feet without the need for a treat. I can walk both dogs at the same time. They love walking right next to each other and preferably always on the same side. They are extremely gentle with the girls. They are protective and constantly alert. A funny thing happened tonight. I was looking at your website for the first time in a while and was watching the video of Chico. Both dogs were in the computer room with me. You spoke in the video about 30 seconds in and both Elsa and Eli jumped up, barking, frantically running around the house, at the windows, all alert. They wouldn't stop barking. I believe they recognized your voice and wondered where you were! I will try to take some current photos. They have changed alot. Elsa is leaner, more muscular, and has a lot of white in her fur. Her hind quarters are mostly light colored. Eli is still jet black, with brown accents. He is more "furry" with a longer, curlier fur. They both still get along well. Eli often licks Elsa's ears and eyes, and they "kiss" often. They have had their moments, with some fur flying, but normally it is brief. Eli is the boss these days, mostly because he is bigger. One example of their "communication" - they both have the same chew toy. When Eli is tired of chewing on his, he barks a certain bark, Elsa will get up, come to his toy, and he will then go to her toy. When he wants to go back to the other toy, he barks again, she gets up, goes to the previous toy, and they keep doing this until Elsa gets annoyed. Then, when he barks, she looks up, growls and goes back to the toy she currently has. If he doesn't give up, he then stands over her and barks this one type of short bark, continuously, until she gives in, or we tell him to stop! We hope all is well with you. We will be in touch. Zocha is doing well. We had her last booster shot yesterday. At 4 months old she weighed in at 32.2 pounds. The vet said she should top out about 80-85 pounds, which is the size of Ruby. Again he commented on how nice she is and growing at the proper speed, not too fast. She's SOLID! Her baby fur is gone and shiny wavy adult hair is in. Belly and tail hairs are getting long. As for her personality, she is shy around loud noises and cars and will run, which we are working on overcoming. She knows what we are talking about and does walk, sit, paw and stay but will NOT recognize come. I have been trying different words to find something that "clicks" in her head. She's not very food motivated and the clicker is not working with that command. I'm sure we are close to finding something that makes sense to her. We are trying 2 syllables instead of one. Finally house trained. About two weeks ago it sunk in that the potty is OUTSIDE. I think part of the issue was we do have carpeting through out the house and in her mind, that's where she went in her kennel, so it took a bit to realize the house wasn't her kennel. But, she's got it now. We absolutely LOVE her!!! She has bonded with all of us, but really has attached herself to my mother and even sleeps in her room. It has taken a while, but Ruby has come to realize that Zocha isn't one of my house sitting job and doesn't go home after 2-3 days...lol. And the cat...OMG! Puppy chases cat...cat chases puppy... back and forth... they are a riot. After they play/herd each other, they nap together. It's cute. I have exciting news! Blue is really good on a leash. I never used one on Slovak so it made it difficult to take him to the vet because they insisted he have a leash on. He is also completely potty trained, no accidents at all for days. He knows how to sit, come, and lay down really good. We used the German that we used with Slo and he is just brilliant with the same commands. He fetches the bal and if he drops it before he gets to me I wait patiently and he looks at me and then turns his head around like he is thinking, hummm, oh yeah, she wants the ball. I can see his little brain going through the thinking steps. He knows Phooey, etc. etc. Smarter by the day Blue is an absolute joy! How is everything? I'm starting to understand Gabby a bit more. He definitely had his own mind and responds well to certain things. Has become very affectionate. This puppy is definitely worth 3000. Glad you sold him to me- 3000 would be out of my price range. Already potty trained; he only goes outside and loiters at the door when he has to go...He loves the lawn... Using his nose to find toys & plays fetch until he gets board with it. He knows his name, come, sit, down, no, mine (for when he attempts to take my stuff - and then leaves my stuff alone and trades for his own), and fuey (bad boy). He's just as sharp as can be and coming along perfectly. Also learned how to share his food - no growling (lol). I'm feeding him FROMM puppy gold twice a day @ 2 cups per sitting; he loves it. Vet check was done on day two and he's a perfect little guy. Got him chipped, and on an inoculation schedule. I just completed the review and will send pics of Ava soon (maybe tonight) for your website. Ava is doing amazing. She is big (57 lbs - 5 months) and is in perfect health and seems to be growing very proportionally. Beautiful and absolutely perfect in every way. Thanks so much again...my family and I could not have asked for a better GSD puppy! Just getting back to work and had to send this photo! Mr. Anouk at 7 months old now. He is triple the weight of his favorite 3 year old! If you notice his right ear cocked back toward her, that ear is ALWAYS listening and radar'ing towards Ava's voice in the house. Where ever she is, that ear is listening for her. He loves her! Our tan and black German shepherd puppies are big boned, traditional, old style Czech German shepherds who will excel in Schutzhund, police duty or as excellent family pets to protect your home. As ethical German shepherd breeders we use only the best German shepherd stud and German shepherd females we can acquire. We use German shepherd dogs with great drive, extreme intelligence, working titles, and the best hips and elbows. We feel confident in our German shepherd puppies and give a comprehensive guarantee for our German shepherds' hips and elbows. You can click on any of the German shepherd dogs from the testimonials page to see individual photographs of each of our German shepherd puppies, comments from the owners of each puppy, links to the webpage for that individual puppy, as well as German shepherd videos, which we maintain for each owner of our puppies, and add photographs and progress notes on each German shepherd puppy's progress. 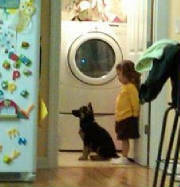 The buyers of our German shepherd puppies for sale in NC. have been unanimous in being enormously pleased with our puppies. 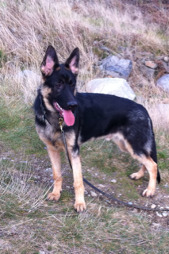 Many of our buyers are repeat customers or friends and relatives of previous buyers that bought German shepherd pups.